A hearty casserole, vegan Greek moussaka features layers of potato, eggplant, savory beaf crumbles cooked with onion, crushed tomatoes, parsley and red wine, and an enriched and creamy cashew-based Béchamel that’s baked until golden brown. My plant-based variation is an adaptation of a generational family recipe from the Greek village of Ardactos on the island of Crete. I tried to stay as true to the flavors of the dish as possible. This recipe requires several components, which can be prepare separately and then assembled prior to baking the dish; however, I’ve written the recipe so the dish can prepared seamlessly from start to finish. Slice the eggplant crosswise about ¼-inch thick. Place a colander into the sink and add layer of eggplant slices. Sprinkle generously with the coarse salt and repeat with layers of eggplant and salt (don’t worry about using too much salt as it will be rinsed away later). Let the eggplant drain about 30 minutes and up to 1 hour to remove bitterness. Rinse well and pat dry on several layers of paper towels. Position an oven rack in the center of the oven and preheat to 350°F/180°C. Line a baking sheet with parchment paper and place layer of eggplant on the parchment. Brush with olive oil and season with a bit of salt and pepper. Repeat the layers as needed. Bake uncovered in the oven for 40 minutes. Remove to cool. While the eggplant is baking, peel and slice the potatoes about ¼-inch thick. Immediately place into a large cooking pot with plenty of cold water to cover. Add 2 teaspoons salt and bring to a full boil. Drain in the colander and set aside to cool. Next, add 2 tablespoons olive oil to a large skillet and place over medium heat. Sauté the onions until tender and lightly golden. Add the water, red wine, tamari, mushroom powder and Worcestershire. Bring to a boil and add the TVP/TSP granules, crushed tomatoes and tomato paste. Stir well, reduce the heat to medium low, cover the skillet and cook about 20 minutes. Stir occasionally. To prepare the Béchamel, add all ingredients to a blender and process on high speed for 2 full minutes. Transfer to a medium saucepan and cook over medium-low heat until the mixture comes to a simmer. Do not boil. Reduce the heat to low to keep warm. Preheat the oven to 350°F/180°C (if not already heated). Lightly oil a 9”x13” shallow baking dish. 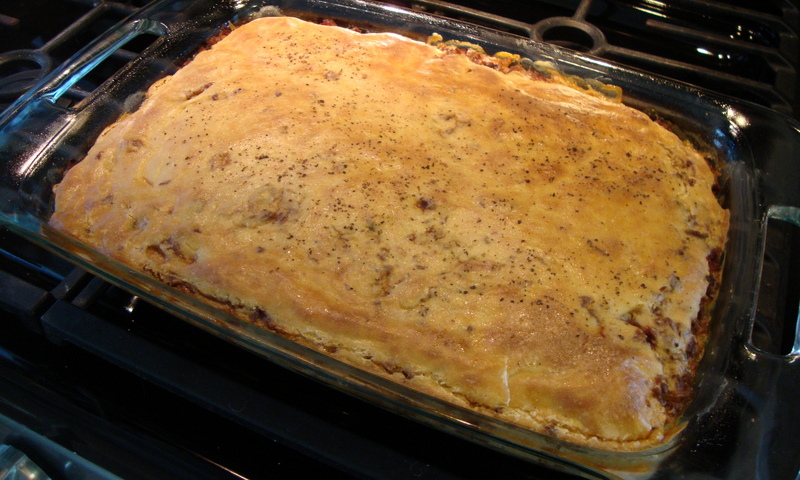 Arrange the potatoes in an even layer on the bottom of the baking dish, overlapping as you layer. Spread about ⅔ cup Béchamel sauce over the potatoes. Next, layer the eggplant slices as you did the potatoes and spread about ⅔ cup Béchamel sauce over the eggplant. 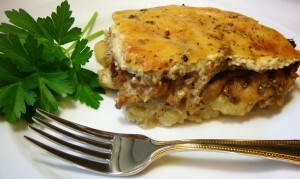 Spread the meatless meat mixture over the eggplant and top with the remaining Béchamel sauce. Season with a little coarse ground black pepper and bake for 50 to 60 minutes or until golden brown on top. Let rest at room temperature for at least 30 minutes before slicing and serving.